I’ve been reading a lot lately about the good stuff in natural unflavored gelatin. It’s anti-aging, good for joints, good for your hair, good for your nails, and good for your digestion. Good gelatin comes from beef bones, and all these benefits are why I try to make a big pot of bone broth every week or two. But when I heard you could also get a lot of this benefit by making treats with healthy gelatin, I was really interested in trying it. 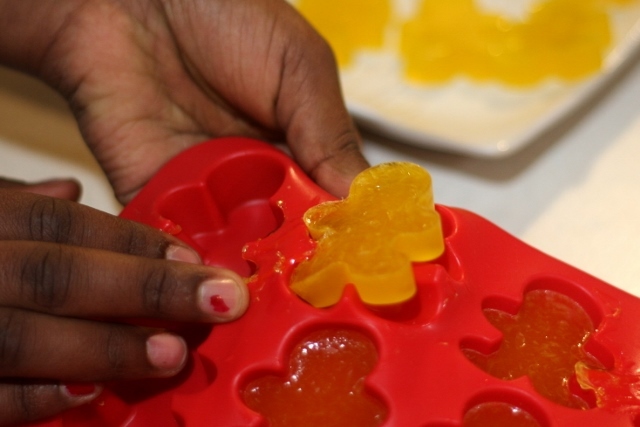 I’m sure that my grandbabies would be interested in yummy chewy homemade gummies and I was pretty sure at least a few of my kids would be game to try them as well. So I ordered a batch of Great Lakes unflavored gelatin and got this cute Wilton Silicone 24-Cavity Gingerbread Boy Mold as well. (They look kinda like gummy bears, right?) When the mold arrived, I was surprised at how big the cavities were. The ‘gummies’ they make are about 1.5 inches long, not the diminutive things I’m used to buying in bulk at Winco. After reading this recipe on Mommypotamus and this one from Small Footprint Family I was ready to give it a shot. Here’s the combination I used. Mix all ingredients except the gelatin and warm on the stove until just simmering. Add gelatin slowly, whisking well as you pour it in. Let simmer gently until gelatin is completely dissolved. Pour into molds and refrigerate until firm, an hour or more. When I used the kombucha in the recipe, I added it after heating the lemon juice, whisking the gelatin in, and letting it cool a few minutes. Heat kills the good probiotics in the kombucha. This recipe made enough to totally fill the mold shown. I poured the remainder into a small flat-bottomed bowl. Once the gelatin had set up, we first tested what I’d poured into the bowl. It clung to the sides and did not come out smoothly. I started wondering if the more complicated little shapes would even come out of the mold. But lo and behold, they came out absolutely beautifully. The tops of the gummies look a little bumpy, because I left the little ‘feathers’ from the fresh-squeezed lemon juice in the liquid. But other side of each gummy was smooth like you usually see. Since I was aiming for sour gummies, I used only a little honey, which did indeed make them quite sour. However, most of my kids liked them and both of my 1-year-old grandsons gobbled them down and asked for more. I think they were a hit. I have two more molds coming soon in the mail (this is fun!!) and am planning to color my next batch with raspberry juice instead of artificial color. If you’d like to read more about the benefits of healthy gelatin to the digestive tract, check out this post by Comfy Tummy. This looks really fun. I never buy gummy candy, so this would be a real treat. “fun” is apparently the common theme brought to mind when reading this. 🙂 I’m thinking an assortment of flavors/colors/shapes could be an easy rotation for Christmas gifts for next year, too. 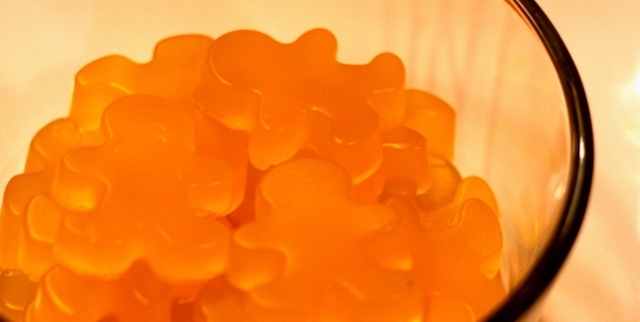 In the picture they look firm like gummy bears, not jiggly like jello. Did they stay that way after they sat out? Made these last night – will alter the recipe next time to be slightly sweeter (I added about a Tbsp of honey) and will try a lemon-lime combo. I’m excited to experiment with the gelatin! Thank you for sharing this idea and recipe! Hope you enjoy the gummies. Might add some sugar if your kids don’t like sour. My recipe is pretty sour. Made these this weekend! I used hormemade elderberry syrup for the water. I LOVE this and will do it as long as I can. No more purple syrup stains everywhere…just pop a gummy in their mouth and they’re done taking their elderberry! So glad it worked well for you! I’d love to hear the advantages of elderberry?